With the recent revelation of the assets held by the famous Padmanabhaswamy temple in trivandrum, kerala, especially trivandrum has become truly a God's Own Country. The assets kept within Padmanabhaswamy temple in trivandrum was an age old mystery which was revealed by officials deputed by the supreme court of India. This news concerning the temple was a breaking news in all the major newspapers and channels worldwide that itself shows the importance of that news. After the news breakout many people from all parts of the world have started visiting the richest hindu temple in the world. Indian tour planners, the travel agent from trivandrum was closely watching those developments with regard to the temple and introduced special tour packages for visiting the temple. We, Indian Tour Planners offers a 4 days and 3 nights tour package covering trivandrum padmanabhaswamy temple, kovalam and kanyakumari. Indian Tour Planners is also offering customized padmanabha swamy tour packages covering all destinations in kerala. Visit the page padmanabhaswamy temple tour package for more details. Last week i have embarked on an adventure trip to the thick forests of wayanad in kerala. From trivandrum i got into a train to reach calicut and from there i got a cab to reach wayanad. For the first day i stayed near by kalpetta. Kalpetta is a most important / populous town in wayanad which is on the path of huge development. One the first day my thoughts about going into the thick forests of wayand was blooming in my mind. I am traveler who likes to embark on adventure trips. In the past several years i have traveled to various adventure destinations in and around kerala. But this is the first time i am reaching wayand to go to muthumalai. Two years back i have reached wayand for the adventure tour but during that time the muthumalai destination was a thick forest and there are no facilities or assistance for an adventure traveler to reach there. But today muthumalai is easily accessible for adventure travelers with moderately good transportation facilities and relatively good accommodation facilities. On my way to muthumalai from kalpetta i was captivated by the nature's beauty. It was about 4'o clock in the evening when i reached muthumalai. My accommodation in muthumalai was arranged at a resort in the forest named "IntheWild". IntheWild is a resort located in a 500 acre private property which is in the natural habitat of wild animals. While on my way to resort i have seen many wild animals like leopards, deers, bears, peacocks etc. It was quite exciting for me to know that i am about stay in the natural habitat of forest. My accommodation was arranged in a single bedroom tree house in the resort. For an adventure traveler who love forests this is actually a heaven. This was the first time i my life i am staying in a tree house and was quite excited. I was quite amazed by the facilities provided in the tree house. But i cant find TV, music players, air conditioners or any kind of entertainment gadgets in the room. On entering the room i realized the room is not for leisure travelers it is solely for travelers who are enthusiastic about nature. Instead of tree houses the resort is also having land resorts built using mud, branches of trees etc... and camping tents. During night a herd of wild elephants reached beneath my tree house and settled there for a couple of hours. Watching the wild elephants this close from the tree house during night was a new experience for me. Those elephants have gone back to the forests after making havoc in the resort. During morning i have seen that some trees near my tree house and some part of fencing around the resort were also uprooted by the elephants. Thank God elephants have discarded my tree house. The next day morning i got up from the bed hearing the sweet sound of birds and haul of wild animals. I got the feeling that my body and soul got refreshed on inhaling the natural and pollutions free air scented with distinctive aroma of wild fruits and flowers. Once i get down from the tree house i have gone to the restaurant of the resort of having my breakfast. The restaurant is having both vegetarian and non vegetarian recipes for the guests. I have opted for the south indian dish dosa, chutney and sambar along with chicken curry. The dishes served in the restaurant is truly mouth watering. In the past several years i have tasted different kinds of food from hotels in India and abroad but the food from this restaurant was very delicious and homely that i didn't forget to appreciate the cook in the resort. I wondered how a cook who was hailing from a tribal family in wayand prepares this kind mouth watering recipes. After breakfast the owner of the resort have guided me to a natural walk in and around the resort. During my walk i have seen peacocks, deers and other wild animals along with some natural water reservoirs. While i was traveling in and around the resort i thought that i am in heaven. I didn't forget to take pictures during my walk. The owner of the resort have recommended that it is better not to walk deep into the dense forests as it is quite dangerous. He also told that his experiences were quite bitter with the animals in the wild. He also told that all the animals have their own territory and if the wild animals get the feeling that we are going to breach their territory, they will surely attack us. As a matter of caution i hasn't gone too far inside the forest but i sighted leopards, beers and other wild birds living in their natural habitat. This journey into the muthumalai in wayanad was quite fascinating and i will remember through out my life. During evening i have checked out of the resort on my way to ooty which is about 40 kms from Muthumalai. On my way back i thought that i will be back to muthumalai some day in my life and will also suggest to my dear and near ones about this destination and the resort. Note for those who wish to travel to muthumalai: Muthumalai is for travelers who loves nature and adventure tourism, it is not recommended for family trips or leisure trips or honeymoon travelers. Click here to view my muthumalai wayanad tour photos in flickr. It is located 15 kms east of sultans bathery on the Wayanad-Mysore national highway. 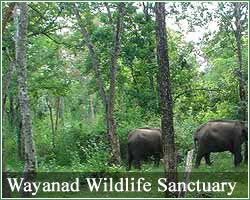 The sanctuary muthanga wild life sanctuary is in the eastern tip of Wayanad .This is the place where the Western Ghats meets the deccan plateau. 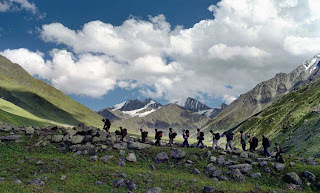 Trekking refers to travel by foot through remote destinations that are, in most cases, inaccessible and unknown to the visitor. This type of holiday is mainly taken in mountainous regions, although this is not a requirement. Trekking is most popular adventurous and fun-chore to enjoy in the hilly and mountainous regions. Trekking becomes more and more interesting when one reaches higher altitude. Adventure enthusiasts are fond of walking in the unexplored mountain trails. Nepal known for holding eight of ten highest peaks of mountains is ideal destination for adventure trip. Trekking can be very troublesome if you do not prepare for the same. Under mentioned trekking guide can be helpful in making the trip more adventurous. Pack your bag in right way .you should carry everything that you can need on trekking tour. Your bag must be comfortable and light to carry on the route. You should carry water bottle, some dry readymade energetic food supplements, a pair of shocks, body warmer, a pair of comfortable sleeper, clothes, etc. You should carry required medicines on your trekking tour. You should keep some medicines for cough and cold. The temperature at higher altitude may go unusually low. Have properly fitted boot for trekking , Comfortable foot wear is must for trekking. You should some more time to find a good pair of boot for trekking. You can easily find such boots in good shoe brand in the market.